Tha’ts what we had delivered yesterday from a food waste composting service. They collect compostable scraps from grocery stores, restaurants, schools & hotels and process it for 8-10 months at their facility. It arrives as perfect 7 pH black gold. We used to purchase soil amendments from garden centers in bags. Never again. Even with the $1/mile one way delivery charge it was a good deal and a gorgeous product. We’ve already got our raised beds amended and huge containers of it stored in the greenhouse. We’ve got other beds around the house and in the back yard that will get some. Thank goodness we have a tractor. The remainder will be worked into the bed we had it dumped onto. It was our potato bed last year and I have just received some beautiful seed potatoes in the mail. But we’ve already expanded it beyond the size we had it last year and I’m hankering to plant some other stuff. Could this possibly be the year I get a pumpkin?? P.S. Those three beds full of green in the foreground contain the garlic we planted last October. Yum. Hi Connie. What beautiful compost. I’m curious to know what the cost is of the compost, just for comparison with our local landscape suppliers. 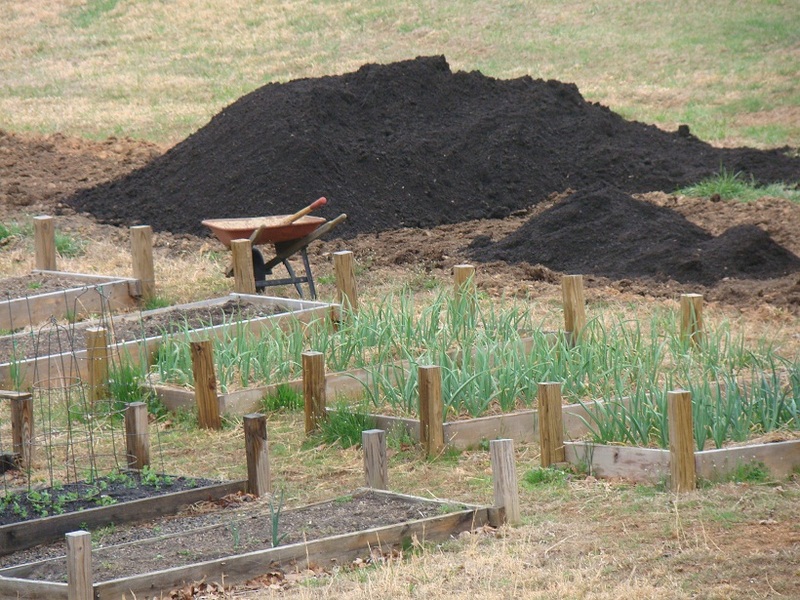 Organic compost here is about $40/cu yard. Also, what are the tall posts for at the corners of your raised beds… for row cover? How many beds do you have? Love your updates… keep ’em coming. Hey Lisa! It runs $35/cubic yard here. We’ve got 12 outdoor raised beds and one in the greenhouse. We have plans in 2011 to add 2 more exterior and 3 more interior. Those posts are for a few reasons. They provide structural strength to the beds (the dirt can’t push the walls out), they will allow us to deepen the beds if we ever want to in the future and they would support row covers if we ever decide we need them. Plus they’re handy to put stuff on when working out in the garden!